It has again been a long gap and I have no reason except for my sheer lethargy and multiple commitments resulting in non-management of my time in the best way possible. Phew! After that long sentence, I hope I can reduce this guilt of being away from long. I would personally like to blame this long gap on the frequent travel. Only issue here is that the travels were much frequent in earlier years and the post frequency then was much better than it is now. So, back to square one! No real reason! Talking about Business travel, a necessary part of today’s corporate life. When did someone close a deal, or influence a new investment over a phone? Video Conference you say? Well, that is just a glamorous way of seeing different people across the geography and deciding on when to meet next to close it. Please don’t even try suggesting the phone. These have long been abandoned even by the College lovers. They prefer facetime! Many people would equate business travel to a rock ‘n’ roll lifestyle, and no blame there. I, after all these years of Business travel, still love these. But well, there are many of my friends who state having a different experience. As per these friends of mine, few unpleasant things are as glamorized as frequent business travel. Really? Don’t you like being up in the air? Their argument – frequent travel leads to unhealthy lifestyles (e.g., poor diet, lack of exercise, excess drinking), while jet lag causes stress, mood swings, disorientation, sleep problems, and gastrointestinal problems, all of which impair job performance. Ranting on, they state the need to be resilient enough to cope with the adverse effects of frequent travel on them and their families. Clearly, these guys sure have a high price to pay for reaching the top frequent flyer status. 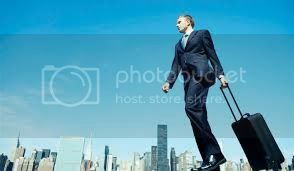 I have been in corporate for more than six years, and one thing that I have realised over all these years is that Business Travel is here to stay. A recent Economist article states the multifold increase in the number of travellers over the years. Yes, this is in spite of the huge strides in Communications technology. To survive in the corporate world, and to survive as an individual, one needs to travel. Full Stop. There are some things that we can take care of though, to ease the pain (if any) out of these Business Travel. Talk to new people and try absorbing the new culture. (During my last visit to Lucknow, in spite of having stayed there for a good two years of my life, it felt so refreshing to have a chat with my cab driver on the way to the hotel. It was like him fast reading the newspaper of over three years, in less than thirty minutes!). So, no matter how many times you have been to the city, the local guy there always knows more than you. Savour the local cuisine – be keen to try out different kinds of food. If you are not the vegetarian types, the world is your playground. Of late, even vegetarians are having a gala time! There is so much to see and eat around us! No? Read the local Newspaper – This is one thing that I have always been fond of. From my childhood days, during our long summer holidays train to Rajasthan, I made it a point to buy newspapers at different stations and then see what is happening local to that place. Helps put in a perspective. Learn some local phrases – This helps in making an immediate connect with the city as well as the locals. And you learn something new. Read and Spend time with yourself – Contradicting to my earlier suggestions, but well the long flights and the innumerable hours spent waiting for the delayed flight at the airport terminal is the best time to be spending time with yourself, sipping on a cup of coffee. surely appreciation for web-site and you’ll evaluate the triasliterntaon around a few of your posts. Certain are full of punctuation complications we look due to this quite worrisome in reality nonetheless I am going to without a doubt hand in all over again. I would just die to have the Dishwasher (DMR78AHS)! My dishwasher is a dinosaur that uses way too much water, sounds like a freight train, and doesn’t even clean the dishes!